PoiZone is a subtractive software synthesizer designed to bring you professional quality results, without a learning curve that hinders your creativity. 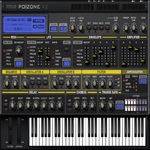 The concept behind PoiZone was to design a synthesizer that had the smallest number of controls while providing the maximum flexibility and features. Useless knobs were ruthlessly removed so what remains is a UI where every knob counts. Once you have spent some time auditioning the preset patches we are sure you will agree that PoiZone packs a lot of punch in what appears to be a simple package, enjoy!